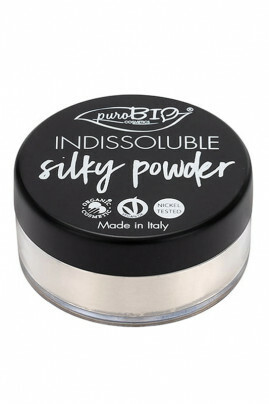 For a long-lasting make-up, the Purobio Organic & Vegan "Indissoluble Silky Powder" Loose Powder is the indispensable make-up touch to mattify and unify your complexion! Composed of natural ingredients such as mica, cornstarch, rice powder, silica and kaolin, it provides a matte and velvety finish by blurring the pores without drying the skin. On the contrary, your skin is soft and imperfections and expression lines are smoothed. Perfect for all skin types, it is perfectly invisible on the skin thanks to its slightly yellow color. With Purobio Organic Powder, you get a smooth and flawless complexion! Poudre de finition qui n'assèche pas le visage (j'ai la peau déshydratée) donc ne convient pas pour les peau grasse. Attention l'odeur est assez forte ! After applying all your organic cosmetics on the face, apply a veil of loose powder on your face to perfect the makeup. For the application; we advise you to use vegan powder brush n°1 for a net result. For the "baking" technique or to fix the concealer on the eye contour, we recommend the use of the blender or vegan socket line brush n° 9. Mica, Zea mays (corn) starch*, Oryza Sativa (Rice) Powder, Silica*, Kaolin, Tocopherol, Parfum (Fragrance), Glycerin, Aqua (Water), Ci 77492 (Iron Oxides), Sodium Anisate, Sodium Levulinate.